Gōng xǐ fā cái! Congratulations and be prosperous! Happy New Year! Welcome to the Year of the Tiger, the year of Geng Yin, the 11th year in the current 60-year cycle, Year 4707 in the Chinese Calendar. The Chinese New Year (also known as the Spring Festival and the Lunar New Year) traditionally begins on the first day of the first month in the lunisolar Chinese calendar. This calendar has been in use for centuries and measures the passage of time - from seconds to centuries - based on the movement of the Sun, Moon, and stars. In the lunisolar Chinese calendar, a year is measured by the duration of time it takes for the earth to rotate around the Sun. This year, 2010, the New Year falls on February 14th (in the International Calendar). The Chinese New Year is the most important of the traditional Chinese holidays and is celebrated as a major holiday in countries and territories with significant Chinese populations. In other nations, the holiday is still celebrated, though not as an "official holiday". (But we celebrated it this year and it was very fun!) Not only does it represent the ending of one lunar year and the beginning of another, but also, it is a time for letting go of old grudges, opening your life to new possibilities for happiness, and sincerely wishing peace and happiness to everyone. Sounds like my kind of holiday. Like any holiday in any culture, the customs and traditions relating to Chinese New Year vary widely. Sometimes gifts are given, special meals are made, and decorations are placed. 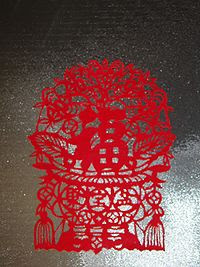 Windows and doors are decorated with red paper-cuts (a traditional Chinese decorative technique of cutting a piece of paper into an intricate design), featuring words like 'longevity' and 'health'; one of the most popular decorations seems to host a symbol of 'fu', which is Chinese for 'luck', hung upside down. The house is traditionally thoroughly cleaned to sweep away bad fortune and make way for incoming good luck. We did this - come on, good new year luck! Come get me! Food traditionally includes items such as pigs, ducks, chicken, and sweet delicacy. We had a meal of my cashew chicken and Janet's turkey and veggie fried rice (yum! ), accompanied by a multitude of desserts provided by our guests. One popular Chinese New Year tradition that we did not partake in was the consumption of Mandarin oranges - the name for these in one Chinese dialect is 'gik' which is a homophone for 'luck' or 'fortune'. Eating these on Chinese New Year is akin to the Southern American tradition of collard greens and black eyed peas on New Year's Day. Another Chinese New Year holiday tradition involves the gifting of money in red paper envelopes. These red envelopes, 'hóng bāo' in Mandarin, are passed from married couples or the elderly to their unmarried juniors - and are traditionally meant to "suppress or put down the evil spirit". The red, seen in the decorations, the envelopes, and the wardrobe of those celebrating Chinese New Year, is meant to scare away evil spirits and bad fortune. **Note: All this I have gleaned from open-source research materials. Don't hate me and don't sue me. Thank you. Very interesting post. I am curious why you didn't eat the Mandarins?